As racehorses and show jumpers continue to command huge prices and stakes, it’s essential they are in tiptop shape and this is where Invertek’s Optidrive P2 has helped an Irish-based company specialising in selling equine water treadmills. 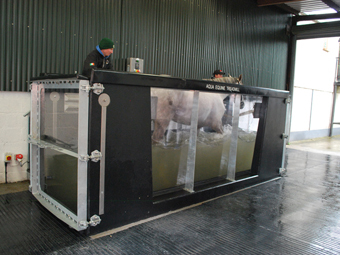 AquaEquine Treadmill Ltd, based in Carlow, Ireland, offers this special service for horses which combines the benefits of hydrotherapy with walking on a treadmill, helping them to recover more quickly from injury. The treadmills are installed worldwide, including two at Ireland’s top stud farms and premier horse trainers, and also in the UK under Nicky Henderson, who is based in Berkshire. Invertek Drives Ireland were able to help by recommending the company install an Optidrive P2 to the treadmill which features both a soft start and soft stop facility and so ensures a perfectly smooth ride for all of the horses. 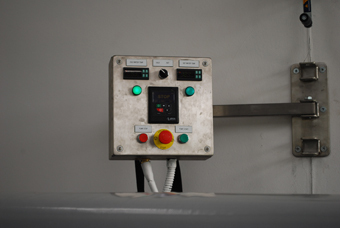 Tommy Tighe, sales partner at Invertek Drives Ireland, said: “We installed an Invertek ODP-2-34075-3F4N-TN to drive a 7.5Kw submersible motor, this controls the walking pace for the animal and the P2 also has a unique Optitools Studio PLC Program installed. “This was created by Stephen Tighe, Invertek Ireland’s product support engineer. The very smooth start, optimised torque control and OLED OptiPad gives the machine and operator ultimate control when these very expensive racehorses are being walked," he added. The treadmill was invented in 2014 by Ireland’s leading Equine Chiropractor Rory Dean who is also director of Aqua Equine Treadmill Ltd.
Rory said: “I am confident that my invention will, in time, replace most of the equine swimming pools and spas and I already have many orders for the AquaEquine Treadmill from trainers and veterinary centres in Europe, USA and the Middle East. “The P2 with Optitools Studio PLC program now makes my machine very robust, easy to install as well as to use and I am expecting many more happy customers in the future,” he added. IP66 wall units come with the P2 which ensures it is completely waterproof and ideal for use in these treadmills where hydrotherapy is an essential part of the treatment. Tommy Tighe, sales partner at Invertek Drives Ireland, said: “I am delighted the Optidrive P2 provides a safe and controlled environment for these horses and ensures they can recover quickly after suffering injuries. “The Optidrive P2 is ideal in such situations with its closed loop speed and torque control ensuring consistency and total control for the user and also reduces mechanical wear and tear which is a vital feature in all conveyor belt applications, especially when they are running underwater like this one. The drive is also simple to install and easy to maintain,” he added.